IT’S PURE EVERGREEN MARKETING WITH NO DOWNSIDE! “Office Fortune” is the first decentralized, cloud-based Chamber of Commerce. We break down barriers such as no physical location needed (dramatically cutting our overhead expenses), No special qualifications to be a member, a small $10 monthly fee to be a member No per-employee fees. No manuals or CDs to clutter your office. No meetings to attend. No Financial Documents Required. No Learning Curve. No Bureaucracy. No Red Tape and Non-Political. Plus, you get a Chamber of Commerce AAA+ Rating for your business. It’s a credentialed service. It’s been proven for years that “credentialed” services will get more sales conversions for your business. It also makes your customers feel warm-and-fuzzy about doing business with you. 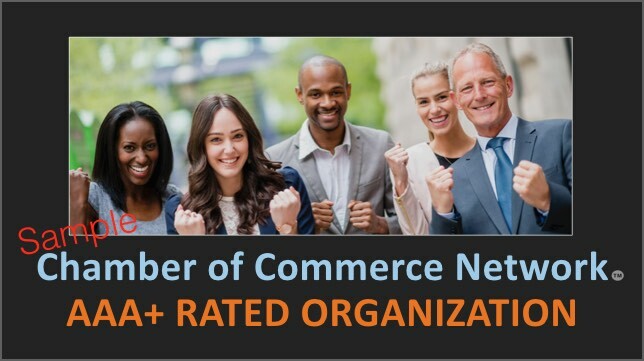 Your AAA+ Rating is immediate and never fluctuates Your Chamber of Commerce Rating also works perfectly with any other “credentialed” tools such as the BBB (better business bureau), Yelp, Business Associations and of course, can be used to enhance your local Chamber Membership as well. You’ll also get (included), the AAA+ Rating logos for your business. How Does The Founder Position Work? You’ll get all types of benefits and services to help your business grow, save on operating expenses and build your business skill-set. Here’s just some of the benefits: Free Discount Medical Benefits Program with no upfront or monthly fees. Use it yourself or for UNLIMITED employees (USA Only). Discounts from National Merchants. Free Payroll Services. Build Your Business Credit (no credit check. Over 15 vendors). How to Build Your Local Business Tool. How to Protect Your Ideas. 100% Barter Free Network (no fees). Tons of Free Business Graphics and Over 20 Pre-Made TV Commercials for twenty different industries … Plus a whole lot more! When our Chamber of Commerce Network was available in a physical, terrestrial environment (now only cloud-based), it sold for $395.00 (that’s the minimum value). As a Cloud-Based Chamber of Commerce “Distribution Licensee,” your clients, customers, donors, prospects and associates will get the Cloud-Based Chamber when they enroll in the $10 monthly membership platform. FREE! (No processing fee applies and the $10 monthly fee is paid by the client to Office Fortune). Your Founder Position, allows you to Market Unlimited Founder Positions andThe Chamber of Commerce Network Memberships. Cool, I Get My Founder Position, What Happens Next? IT’S SIMPLE AS 1-2-3! Call us at our new distributor line: 775-419-6117 and leave a message that you’ve sent the email..
Well begin your account setup (usually within 24-hours) and notify you when your account setup is complete. Please Note: Speak clearly and slowly when leaving the phone message so we get your information correctly. Note: If you Pay through Paypal, we will receive yor email information, however it may not be the email you choose to use for this platform. Next. Capture Parties Information. Our Founder program DOES NOT currently include a capture system. (not mandatory) There’s plenty of free capture forms to get or use your favorite autoresponder service. So, BEFORE you direct any interested party to the Founder Position, have them fill out your capture form or autoresponder first, this way, whether they ultimately join or not, you’ve got their information. Once they fill out the form, have it redirect to: www.officefortune.com with your promo code. Finally – Start Inviting People. They are Waiting for This Rare Evergreen Opportunity Simply direct your prospects to: www.officefortune.com (or capture form preferred), prospects see the information just like you did, click on the sign-up link you send them and simply join with YOUR promo code. JOIN! Market Our Founder Opportunity – Make Money Fast! The “OFFICE FORTUNE” FOUNDER Has Unlimited Opportunities! As a paid “OFFICE FORTUNE” FOUNDER, this also makes you a Qualified FOUNDER Affiliate (should you choose to market the Founder Opportunity). Here’s How It Works. The retail price for the Founder Position is: $397. HOWEVER, if someone purchases the FOUNDER through one of our “authorized” Founders (which could be you), they can save $100 and you make $100 per-sale. As a FOUNDER, prospects will pay YOU directly, upfront, the FULL $297 easily streamlines the enrollment process. This payment method prevents you ever having to wait for your commission (you can paid daily, even multiple times daily). Use any method of payment collection you want. Then, once you receive payment, you’ll forward to Corporate “OFFICE FORTUNE” the balance of $97. We prefer payment by PayPal, but of course, if other arrangements need to be made, that’s ok. Contact us if any questions. What is The Pricing For a FOUNDER POSITION? Here’s the fine print. – It’s a One-Time $297 with No Monthly Fees. Your Founder Position includes authorization to offer others’ Founder Positions UNLIMITED Founder MEMBERS and you’ll also will be an Authorized Founder and earn $200 on every person you enroll as a Founder PLUS … You get your own private website, similar to this one, so when you invite people to the “Office Fortune” Founder member sign-up page, you are ready to go. (Separate websites are not required by “Office Fortune”, however, all websites must be prior approved by “Office Fortune”) Please Note: To obtain a “Founder” Affiliate Position, There’s a TIME-LIMITED $297 Offer. Save $100 Off The FOUNDER POSITION Fee! The Founder position is a non-salaried position with Office Fortune, Founders are paId through commissions earn from Office Fortune products and services only.